The East will meet the Southwest in aviation training as Southern Utah University and Marshall University explore options to jointly offer a four-year bachelor’s degree in aviation at Marshall’s South Charleston campus in West Virginia. Marshall and SUU have signed a memorandum of agreement to cooperate to develop a curriculum. Marshall and SUU will be looking to create synergy in programming while building off each other’s strengths. The agreement involves an exploratory process into an array of aviation programs on the South Charleston and Huntington campuses by working with Yeager Airport and Huntington Tri-State Airport. These include helicopter (rotor wing) and airplane (fixed wing), maintenance, aviation safety, and aviation management programs. Marshall President Jerome A. Gilbert and SUU President Scott L Wyatt signed the MOA during a recent visit to SUU by Marshall personnel. Boeing and Airbus, comprising the majority of the commercial airlines, projects that over the next 18 years they will need over 1,100,000 pilots and 1,200,000 maintenance workers. Furthermore, these two companies anticipate estimate needing around two million cabin crew members. Marshall University is located in Huntington, West Virginia and has a student population of about 13,000. Gilbert and Wyatt agree that their universities will be stronger together than they will by themselves. Southern Utah University is located in Cedar City, Utah and has a student population of more than 10,000 students. SUU Aviation’s university flight training program has the largest collegiate helicopter fleet in the nation and robust airplane and helicopter flight training. 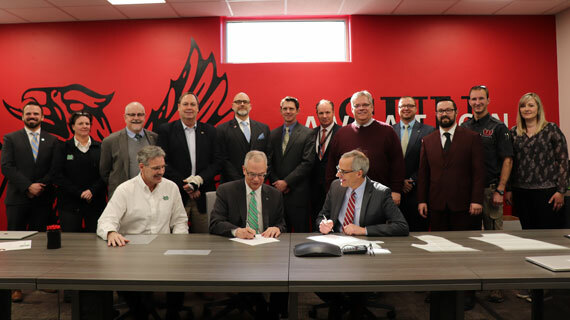 Photo caption: Marshall University President Jerome Gilbert (center) signs a Memorandum of Agreement with Southern Utah University President Scott Wyatt (right) to explore options to jointly offer a four-year bachelor’s degree in aviation to teach students to fly helicopters. Seated to Gilbert’s left is Jaime Taylor, Marshall’s provost. The second row is comprised of representatives from both schools.